On Tuesday, members of the Peaceful Resistance of Santa Rosa, Jalapa and Jutiapa together with the Xinka People’s Parliament of Guatemala delivered the following letter to the attention of Tahoe Resources' new CEO, James Voorhees, and Executive Chair, Kevin McArthur. They call for an end to the environmental harms, community division, militarization and repression that the project has brought into their lives, and demand that Tahoe Resources permanently close the mine. 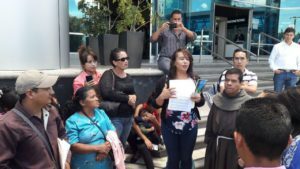 The community members presented the letter to representatives of Tahoe Resources at their offices in Guatemala and was simultaneously delivered to Tahoe’s headquarters in Reno, Nevada by members of the Progressive Leadership Alliance of Nevada (PLAN) on behalf of the signatories. The company's subsidiary "Minera San Rafael" released a statement shortly after stating that they "remain open to dialogue and active listening to any concern that leaders have regarding their operations" in order to "build bridges" and "continue to work together in peace". If the company is truly listening, however, it is vitally important that it pay attention to what the communities are expressing with with the letter: that the opportunity for dialogue ended when the mine was forced on them against their will and that they are looking for mine closure not coexistence. Support the communities in sending a clear message by taking action here. Mr. Kevin McArthur, Executive Chair Mr. James Voorhees, President & Chief Executive Officer, Director Tahoe Resources Inc. Since 2011, our communities have been actively demonstrating peaceful resistance to Tahoe Resources’ Escobal mine given the actual and potential impacts on our way life, water, land, and livelihoods. We held marches, organized 18 village and municipal referenda and filed more than 200 individual complaints against the exploitation permit before it was granted in April 2013. But you didn’t listen. Instead, you pushed ahead with the project, despite broad and clear opposition to mining in our territory. Your insistence, and the tactics used to impose the project, brought an end to the peace and tranquility we enjoyed. As a result, we have suffered divisions within families and communities. We have endured criminalization and militarization, like what took place during the state of siege in May 2013. Community members have been assassinated, jailed without grounds for months on end, attacked, surveilled, threatened, and intimidated. We have also suffered damage to homes and impacts on our water and agricultural livelihoods. Since June 2017, thousands of people from the three departments of Santa Rosa, Jalapa and Jutiapa have organized to set up a 24-hour, 7-day a week encampment in the municipality of Casillas to prevent mine related traffic from reaching the mine. The participants are demanding the permanent closure of the Escobal project. In November 2017, we went to Guatemala City and began a second ongoing encampment at the entrance to the Constitutional Court, in protest of the court’s failure to issue a ruling within the designated time frame regarding the suspension of the mine for discrimination and failure to consult with Xinka Indigenous people. Let us be clear: Our opposition to mining in our territory and the future of the Escobal mine specifically does not depend on the outcome of the legal case currently before the Constitutional Court. Our encampment in Casillas and peaceful resistance in the region will continue until the mine is permanently closed. We have already held our own processes of consultation in which the vast majority of people in the affected area have said no to mining. We will not change our minds. The time for dialogue was before Tahoe forced the mine on us in 2011. Now, all we want is closure.